We’ve focused a lot on the A105 scheme in the west of the borough in this group, as that’s where most of the Cycle Enfield action has been. But meanwhile Ponders End in the east has been quietly transformed, right at the heart of its high street. 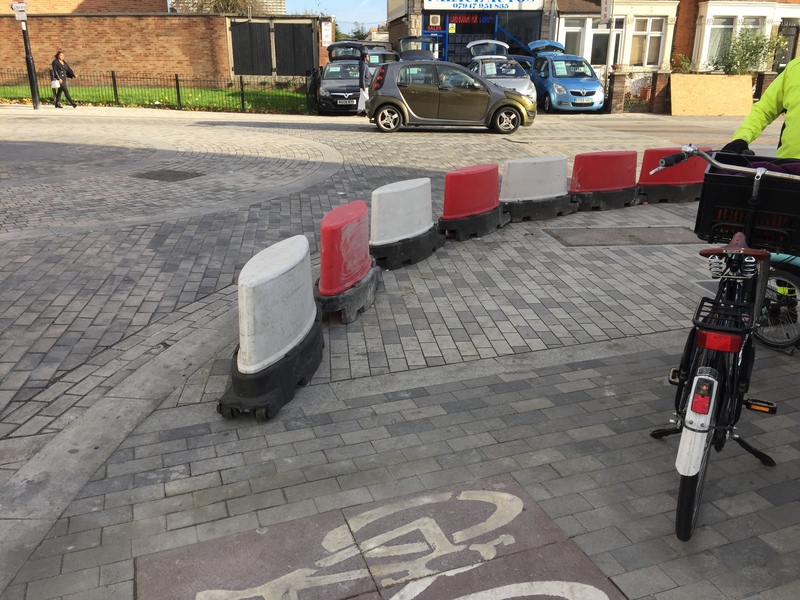 In November 2017, four members of Better Streets / Enfield Cycling Campaign went to have a look at what’s been happening. I’d personally only seen the scheme on paper until then, and had concerns about the ‘shared space’ design. The three others live locally, and their feeling was that while it isn’t perfect, where it’s complete the new layout, traffic flow and look of the street was much better than before. First, there is no doubt that the paving and design of the street makes for a much more attractive street scene. But how well does the shared space concept work? 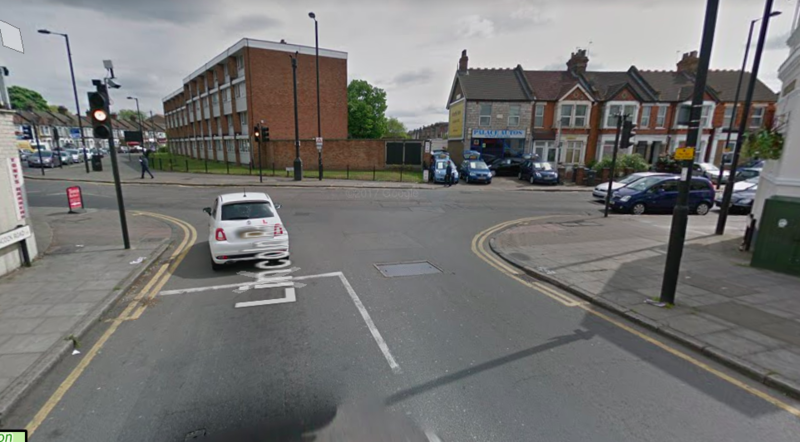 The idea in Ponders End is that features like roundabouts, zebra crossings and even the kerb are more ‘implied’ than enforced, and that drivers, missing the usual cues, cautiously slow down and negotiate with the other road users. It’s not a concept that cycle campaigners are overly fond of, as it’s been proven time after time to lead to drivers bullying more vulnerable road users out of their way. However, the ECC members who live locally say that the junction of the A1010 with Lincoln Road is working much better for traffic and pedestrians than before construction. Previously the traffic queues would be much longer, drivers did not respect red lights out of frustration, and there was no pedestrian phase so pedestrians had to wait a long time for a chance to cross. We didn’t see any traffic queues, and neither were drivers speeding through the junction – although this was 2pm, so a quiet time of day. Was the smoother traffic flow caused by less traffic using the junction since it reopened in September, drivers having found other routes during the closure? Or is this design working better for traffic than the old one? We saw people using the implied zebra crossings without incident – drivers appeared to be respecting pedestrians using them, stopping as soon as anyone approached on foot. On the other hand there have been reports on Twitter of some drivers not respecting pedestrians on the informal crossings, and passing too closely while they are still crossing. To cycle across the junction, you have a choice – either leave the newly provided semi-segregated cycle lanes and cross the A1010 with traffic, or share the footway with pedestrians and ride around the junction (cycle logos on the footway indicate that cycles and pedestrians can share). For the latter option, we were concerned about pedestrian/bike conflict. 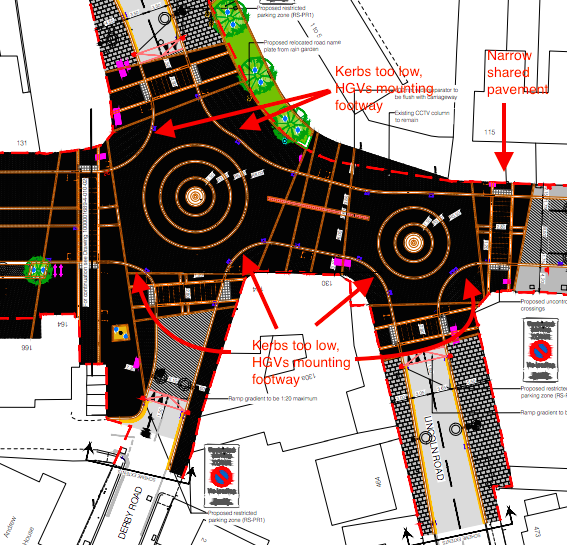 Also, the footway becomes very narrow on the south east side of junction (see ‘narrow shared pavement’ on the annotated drawing below). One of our members who rides a recumbent trike struggled to fit it on the footway at that point. This section therefore isn’t conducive to inclusive cycling, such as for anyone using a hand cycle, trike or cargo bike, wanting to go south on the A1010 or turn right into Lincoln Road – not everyone will be confident to cycle in traffic here, especially to make a right-hand turn. We saw one person on a bike signalling to turn right onto Lincoln Road from the A1010, and he was waved across by a driver who stopped to let him go. However, on social media a cyclist who rides through this junction every day has reported that drivers are ‘not cautious’ as they share the road with bikes, and he would prefer to be completely separated from motor traffic. So, bikes having to share space with either pedestrians or traffic to cross the junction is not ideal. On the other hand, we recognise that this design is much more conducive to cycling than the previous one. The bus boarder outside Tesco is very narrow at 1.2 metres without a 0.5m buffer next to the carriageway. Given the generous width of pavement here we are wondering why a wider boarder or bypass wasn’t built instead. 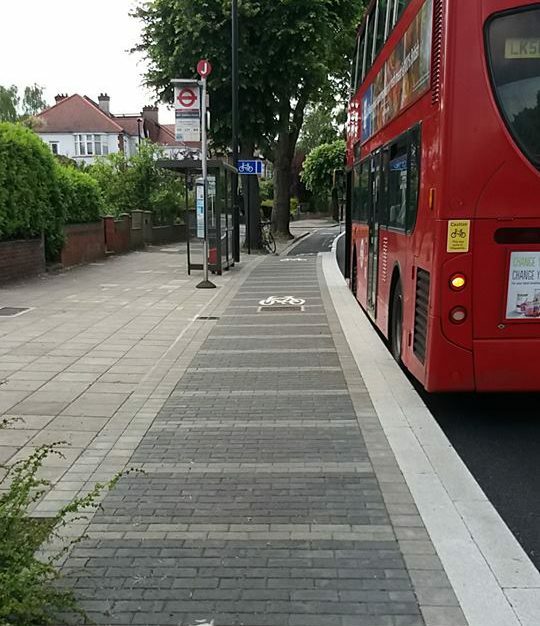 All the bus boarders seemed to lack the width / buffer zone allowed for on the A105 bus boarders – nor do they have the attractive paving of the A105 ones. Finally, we looked at Derby Road. Prior to the regeneration scheme, Derby Road had two-way traffic but no entry from Lincoln Road except for cycles. The corner of Derby Road was built out at the junction with Lincoln Road, to prevent entry of traffic to Derby Road from Lincoln Road. 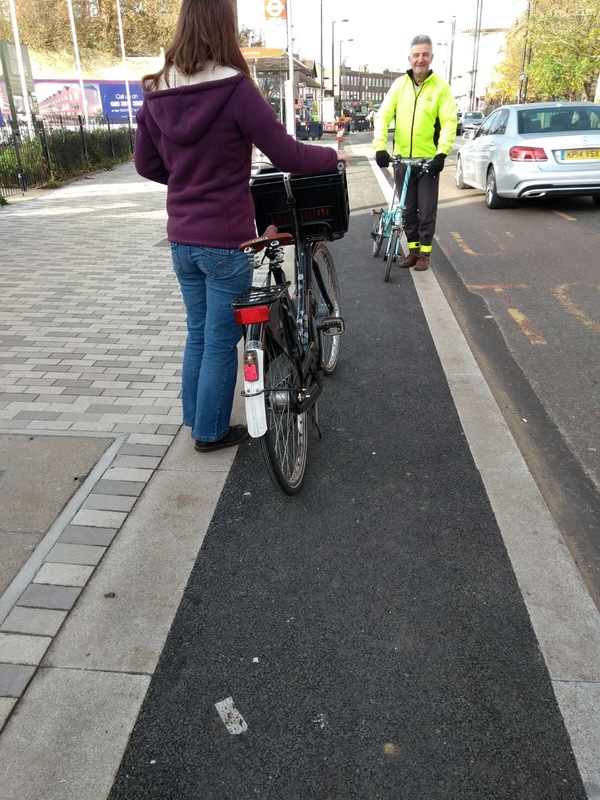 There was a short pavement crossover cycle lane, with dropped kerbs at each end, to facilitate safe passage of cycles turning left from Lincoln Road to Derby Road. The carriageway in Derby Road is marked as a cycle route with cycle decals and was a recognised preferred route for cycle traffic. Derby Road appears on TFL’s Cycle Maps as a quiet route. The built-out corner at the junction with Lincoln Road has now been removed. The pavement crossover has also been removed. The junction is no longer a no entry from Lincoln Road into Derby Road. The result is a road which is dangerous to both cyclists and motorists. Derby Road at the Lincoln Road end is narrow and has parking on one side. It is not possible for two cars to pass where there are parked vehicles. Drivers entering from Lincoln Road have a propensity to drive very quickly up to the right hand bend to avoid meeting another driver in the opposite direction. The result is very dangerous for cycle traffic, in particular when travelling from High Road towards Lincoln Road. In this direction there is no line of sight around the left hand bend in Derby Road and speeding traffic represents a danger to anyone travelling in this direction on a bicycle. Sadly, Derby Road is now used being used as a rat run by drivers wishing to avoid the Lincoln Road/High Road junction. We think that the Ponders End work, when the A1010 scheme as a whole is complete and joined up, could see a rise in people cycling. The design does give more space to riding a bike along the route than existed before (i.e. nothing), and the route joins up several town centres as does the A105. But it would be even more effective if side roads were treated to reduce traffic, using no-entries, opposing one-ways or modal filters – that way people have a safe route to get to and from the lanes on bikes, while residents get to enjoy respite from rat-running traffic. We therefore hope that the council will re-think side roads like Derby Road. Take action for quieter neighbourhoods… by Sunday!